When Amazon launched the Echo back in late 2014, it kicked off one of the biggest trends in tech. Almost overnight, it seemed like every company wanted to get in on that sweet smart speaker action. However, largely because Amazon was first to market, the Echo has consistently been the top-selling smart speaker for the last three and a half years. 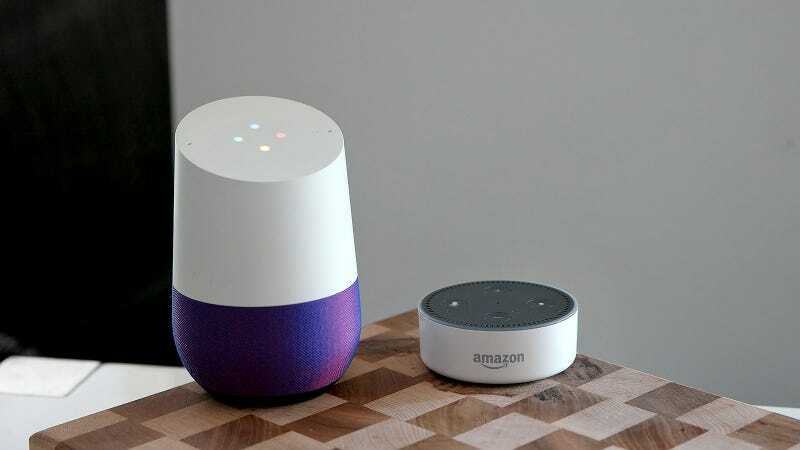 That is, until Q1 2018, when Google knocked Amazon out of the top spot for the first time by increasing sales of Google Homes a staggering 483 percent year-over-year to 3.2 million units versus 2.5 million Echo devices for Amazon, according to tech research firm Canalys. This is an important moment for the still-growing smart speaker market. It suggests that Amazon’s first-mover advantage may be finally coming to end after originally holding a two-year lead over Google, which launched the original Google Home in late 2016. At the same time, this could also be considered a huge victory for Google. Its Google Assistant is widely regarded as the “smartest” disembodied AI, but for a long time, it was stuck trying to catch up to the Echo’s more mature ecosystem and larger user base. However, the smart speaker war is far from over. Amazon still holds a significant lead in total devices sold, with an overall market share of 69 percent versus just 25 percent for Google, as of January, according to Edison Research. As far as the rest of the Q1 2018 sales go, Alibaba and Xiaomi finished in third and fourth, with smart speaker shipments accounting for 11.8 percent and 7 percent of total sales, respectively. All told, those top four companies accounted for nearly 83 percent of all smart speaker sales, leaving companies like Microsoft, which launched its own Cortana-powered speaker in partnership with Harman Kardon last year, and Samsung, which rumors say will launch its own Bixby-powered speaker sometime this year, scrambling for the remaining 17.3 percent of the market. And then, of course, there’s Apple, whose Siri-powered HomePod launched just three months ago to a rather tepid response because, while it has been praised for having great audio quality, its high price and limited digital assistant features have prevented Apple’s normally ravenous fan base from getting into the smart speaker game.